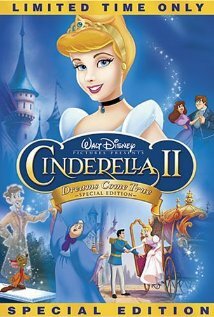 Animated Film Reviews: Cinderella II: Dreams Come True (2001) - Fairy Tale Cinderella Returns in this Fine Disney Movie! 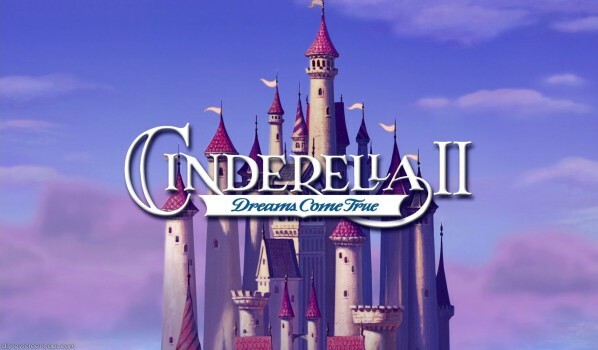 Fairy tale Cinderella returns in this Disney movie, "Cinderella II: Dreams Come True" (2002), directed by John Kafka from a script by Jill E. Blotevogel, Tom Rogers and Jule Selbo for Walt Disney Studios Home Entertainment. 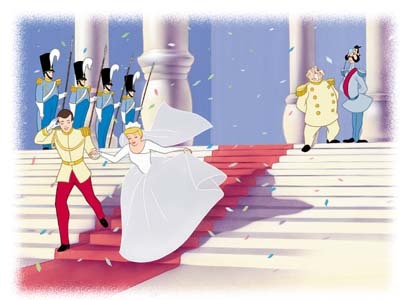 This Cinderella movie was a huge financial success as a long-awaited direct-to-video animated sequel to the classic 1950 Disney movie fairy tale "Cinderella." 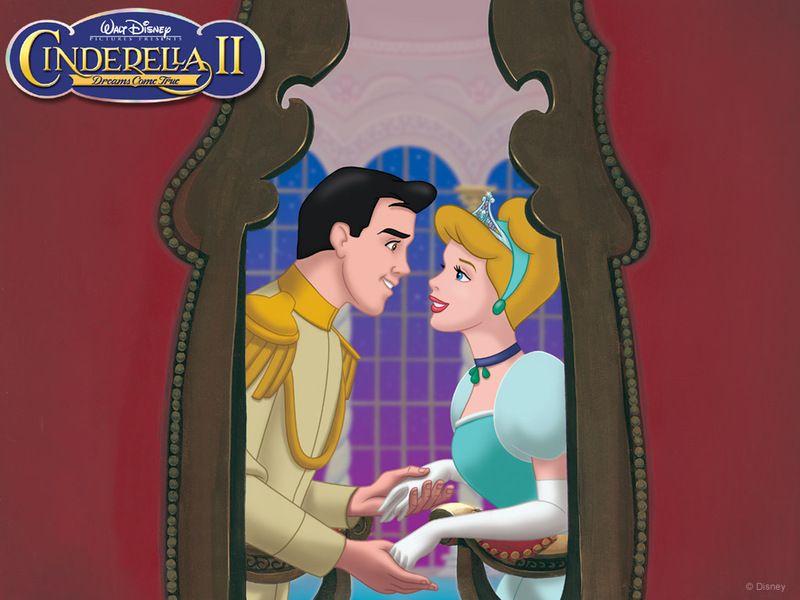 Even though this Cinderella movie was the best-selling of all Disney movies released directly to the home market, it could not satisfy the public's thirst for more fairy tale Cinderella movies, so another fairy tale Disney movie, "Cinderella III: A Twist in Time" followed in 2007 as an odd sort of sequel/prequel. As is well known, the fairy tale Cinderella (Jennifer Hale) lived "happily ever after," but that doesn't mean her subsequent life was uneventful. 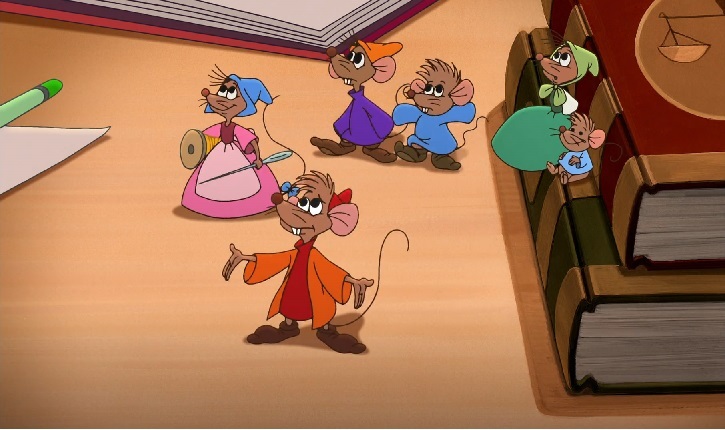 Cinderella's Fairy Godmother (Russi Taylor) loves to tell the tale of Cinderella's discovery, and when the Fairy Godmother is reading it aloud one day, Cinderella's mice friends Gus (Corey Burton) and Jaq (Rob Paulsen) arrive to late. The mice resolve to tell what happened to Cinderella after she married the handsome prince, and three stories in particular come to mind. 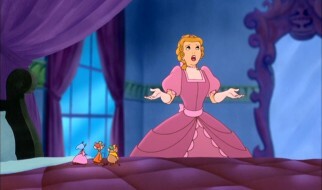 In first fairy tale Disney movie segment "Aim to Please," Cinderella is in charge of planning the palace banquets and parties. She finds that the woman previously in charge, Prudence (Holland Taylor), is mean-spirited and rude. Cinderella decides that the kingdom's parties are too elitist, so she opens up the next one to ordinary folks who can act as they see fit. In the second fairy tale Disney movie segment "Tall Tail," Jaq the mouse has developed a complex about his size. He thinks that he is useless because of his small stature. The Fairy Godmother turns him into a human so that size is no longer an issue. Pom Pom the Cat ( Frank Welker), though, doesn't like the mice, and he still chases them around. Jaq turns out to be in love with a fellow mouse named Mary (Taylor), and after an incident with an elephant at a fair, he accepts and welcomes being a mouse. In final fairy tale Disney movie segment "Uncommon Romance," Cinderella's evil step-sister Anastasia (Tress MacNeille) finds love with a common baker. Lady Tremaine ( Susanne Blakeslee) and older sister Drizella (Taylor) do not approve and say unkind things about the nice young man and his bakery. Lucifer, meanwhile, chases Cinderella's mice around and runs into Pom Pom, falling in love. Anastasia has all sorts of problems when she goes to see her boyfriend, getting kicked by a horse and crashing into his shop. Cinderella tries to help the two get together, while the mice decide to help Lucifer win Pom Pom over as long as he agrees to stop chasing them. He strikes the bargain and romances Pom Pom, but she tells him she wants him to bring her the mice for dinner. Lucifer tries to catch them, but they drop a bucket of water on her and she is so upset that she leaves Lucifer. The baker asks Anastasia to the upcoming ball, and she agrees despite her family's disapproval. He is so sweet that she falls in love with him. The fairy tale mice have various funny adventures unrelated to the Disney movie segments themselves while telling their stories. After the last one, they sing "Bibbidi-Bobbidi-Boo" and go to find fairy tale Cinderella to tell her about their stories. 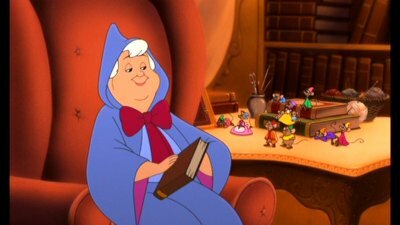 Cinderella loves the idea of her mice friends writing a fairy tale Cinderella book about their adventures, and they all go by the fire as she starts to read it. The Disney movie's songs appear on "Disney's Princess Favorites," sung by Brooke Allison. 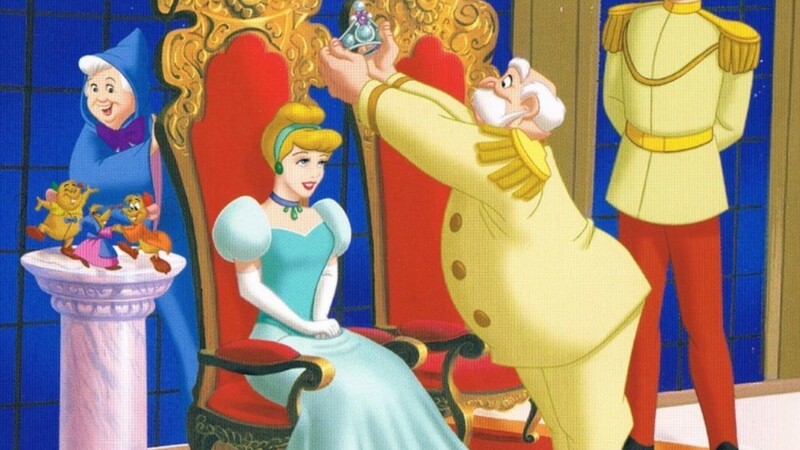 Viewers tend to have strong feelings about any attempts by fairy tale Disney movies such as this Cinderella movie to tarnish the magical legacy of the classic fairy tale Cinderella story. While a top seller, nobody seemed to like this Cinderella movie, except, perhaps, for the children for whom it was intended. Indeed, the entire product appears aimed squarely at the youngest viewers, with notes on the DVD packaging explaining what a composer does and simple things like that. 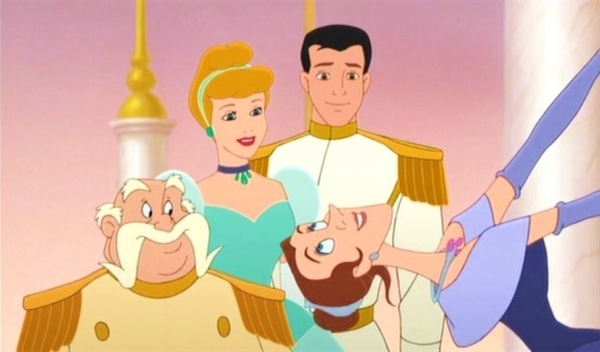 The new Cinderella characters also are not that interesting. The fatal flaw of this Cinderalla movie is that this entire fairy tale Disney movie is more about others than it is about fairy tale Cinderella herself. This may be one of the reasons why this title was removed form the list of available Disney movies back in 2008, perhaps never to return - but, considering that Disney movie sequel "Cinderella III: A Twist in Time" was withdrawn at the same time, it may just have been Disney doing its usual job of guarding the legacy and keeping the Disney movie currency strong. Fortunately, children don't worry too much about subtle plot points or whether Cinderella gets enough screen time in this Disney movie. For them, this Disney movie is a wonderful addition to the fairy tale Cinderella story. To say that this quality Disney movie is "disappointing" is unfair, because nothing could measure up to everyone's enchanted memories of watching the original Disney movie fairy tale "Cinderella" as a child. This sequel was doomed to be hated by adults while secretly cherished by small children everywhere, and it fulfilled that function extraordinarily well. 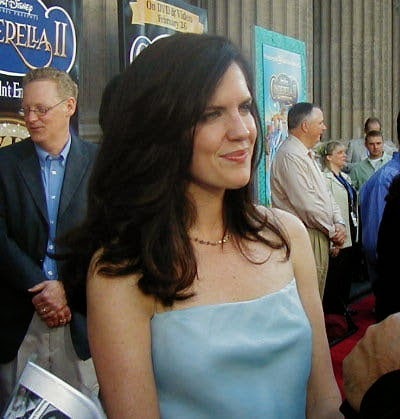 Jennifer Hale, a fine actress who got her start way back in 1988 in the made-for-TV movie "A Father's Homecoming," is great a playing heartwarming roles and plays Cinderella perfectly and in "Cinderella III: A Twist in Time" as well. Jennifer, in fact, did so well as Cinderella that she has become continuing presence voicing minor characters in Disney films such as "Wreck-It Ralph" and "The Little Mermaid: Ariel's Beginnings." When this fairy tale Disney movie was made, sequels to classic Disney movies were being churned out in large numbers. This particular Disney movie one tends to lose sight of the original fairy tale Cinderella, making her a modern sort of girl who is not as loveable as in the original. Turning the fairy tale on its head and making one of the evil step-sisters sympathetic seems muddled at best. It is almost as if the creators of this fairy tale Disney movie sequel got confused about the characters and took away all their specialness, leaving the fairy tale Disney move characters with modern phrasing and a complete lack of charm and uniqueness. The fairy tale mice are the real stars of this Disney movie Cinderella sequel, so it really isn't about the fairy tale Cinderella story much at all anyway. 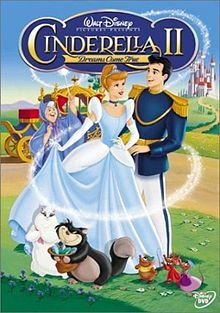 Simply take this as a cute Cinderella movie with warm, cuddly small mice for kids to delight in and you won't be disappointed (they also might like "The Rescuers"). Everyone over the age of eight should respect the fact that this fairy tale Disney movie is not intended for them and give this particular Disney movie a pass if they think it might tarnish their golden memories of the plucky fairy tale little girl Cinderella who fulfilled every little girl's dream and snagged her very own fairy tale Prince Charming. Below is the trailer for this fairy tale Cinderella Disney movie, and below that a fan video about the fairy tale Anastasia/baker romance.